It's been a long time! Last time I blogged I was in Europe. Wow. Since then I've been based in Cambridge and had a summer-full of adventures in Newport, Tahoe, Sonoma County, San Francisco, and New Hampshire. And I'm happy to announce that my next and more permanent stop is DC! Because a) I just couldn't stay away, but more accurately b) I got a job. So I'll be re-joining the full-time work force, two years older, a Master's degree smarter, and many friends richer, back in the lovely city where I started. To celebrate, of course, I baked a cake. Earlier in the summer I made a flourless chocolate cake which other people liked, but I thought it was dry and just not very good. So I vowed to keep trying until I found a better recipe. Well I don't need to search any longer! This recipe comes from my friend Caroline, who claims it's THE BEST. And you know what? She's right. This cake is like the love child of a traditional super-rich and fudgy flourless chocolate cake and a light toasty-edged angel food cake. You definitely get the satisfying decadent chocolateyness, but because the egg whites are beaten and folded in, the cake puffs up and is almost spongey around the edges. 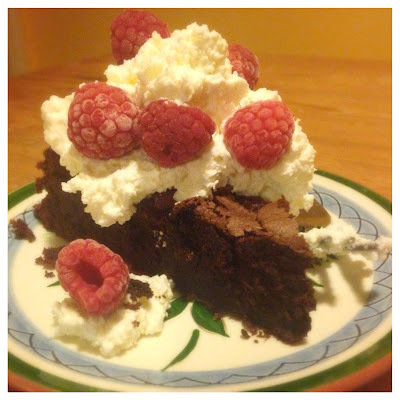 I served it with homemade whipped cream (try adding rum instead of vanilla) and raspberries. And I will definitely be making this again. Preheat oven to 350°. Lightly butter a 9" springform pan. In a microwave safe bowl, chocolate, oil, and ½ cup butter. Microwave for 45 seconds at a time, stirring in between, until chocolate is melted. Separate 4 eggs, placing whites and yolks in separate medium bowls. Add cocoa powder, vanilla, salt, ¼ cup sugar, and remaining 2 eggs to bowl with yolks and whisk until mixture is smooth. Gradually whisk yolk mixture into chocolate mixture, blending well. Using an electric mixer on high speed, beat egg whites until frothy. With mixer running, gradually beat in ½ cup sugar; beat until firm peaks form. Gently fold egg whites into chocolate mixture in 2 additions, folding just until incorporated between additions. Scrape batter into prepared pan; smooth top and sprinkle with remaining 2 Tbsp. sugar. Bake until top is puffed and starting to crack and cake is pulling away from edge of pan, 35-45 minutes. Transfer to a wire rack and let cake cool completely in pan (cake will collapse in the center and crack further as it cools).